Peer teaching empowers students to help their friends learn new things. By playing an active role in the transmission of new material, students really take ownership of and responsibility for the success of the whole class. Peer learning occurs when students teach each other, rather than learning exclusively from the instructor. By utilizing the strengths of our students for instructional purposes, teachers can take full advantage of peer learning to create better, more engaging lessons. Peer teaching happens when students take on the role of the teacher, presenting new information to their peers. The students are responsible for small amounts of material, which they must carefully plan under the guidance of an instructor, before they are ready to share it with their friends. This gives children a sense of ownership over the material they are teaching, and allows them to come up with new and exciting ways to present the information. The peers who are being taught also benefit because they have a chance to see their friends in a whole new light, and they may even decide that they would like to try it themselves. What is the role of the teacher in peer learning? Nothing can replace a great teacher, including a student who is taking part in peer learning. There is a reason that instructors study their craft and do fieldwork before jumping into their own classrooms. Experience offers many benefits, and that is why children who are instructing their peers need the guidance of their teachers. Kids might not know the best way to present the information or how to divide up the lesson time. An experienced teacher can help a child brainstorm and present the information in an engaging way. In the worst case scenario, a student might be presenting information in a false or misleading way. To prevent that from happening, there needs to be oversight from the professional teacher, who will review the lesson before it takes place, and observe as it is happening to make sure everything runs smoothly. What are the benefits of peer teaching? There is much to be gained from students teaching each other. Teaching something is the best way to learn, because you have to review the material many times and process it in multiple ways in order to present it in a way that is coherent and engaging for the audience. Sometimes students make the best teachers because, having recently learned the material themselves, they can anticipate where the difficulties lie and therefore provide clearer explanations in those areas. Additionally, because students like their friends, they are likely to respect them and pay attention to what they are saying, which will make the experience successful both for those giving the lessons and for those who are learning from them. Reciprocal teaching is a special kind of peer learning based on predicting, clarifying, summarizing and question generating. The student teachers first learn from the actual instructor who models the method. Then the students are split into groups of four, in which each student has a unique role. The summarizer summarizes the text that the students have read together. The questioner asks about anything that was unclear in the text, and then the clarifier tries to answer those questions. Finally, the predictor makes an educated guess about what might happen next in the story, or what information might be provided in the rest of the text. Reciprocal teaching is unique because it allows each student to take on a small part of the teaching role, rather than having one student instruct the rest. 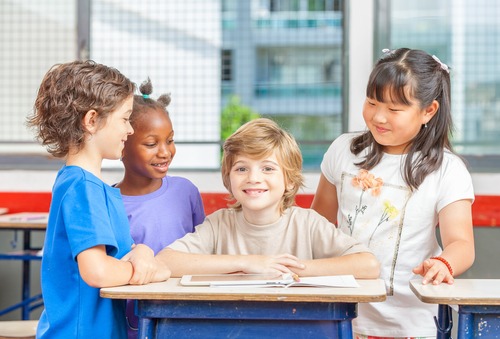 Whether you choose to use classic peer teaching or reciprocal teaching, or some combination of both in your classroom, your students are sure to benefit from this empowering experience. As long as the teacher goes in with a positive attitude and guides the students closely, this can be a real opportunity for them to shine and take ownership of their own education.